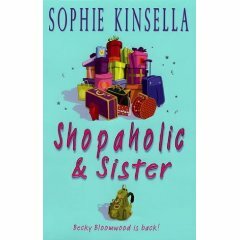 Shopaholic and Sister by Sophie Kinsella – It's Time to Read! Becky Bloomwood is back! Becky thought being married to Luke Brandon would be one big Tiffany box of happiness. But to be honest, it’s not quite as dreamy as she’d hoped. The trouble started on honeymoon, when she told Luke the tiniest little fib, about the teeniest little purchase. Now she’s on a strict budget, she doesn’t have a job – and worst of all her beloved Suze has a new best friend. Then she receives some incredible news. She has a long-lost sister! Becky has never been more excited. Finally, a real sister! They’ll have so much in common! They can go shopping together…choose shoes together…have manicures together…Until she meets her – and gets the shock of her life. It can’t be true. Surely Becky Bloomwood’s long-lost sister can’t…hate shopping? A sister, a soulmate, a skinflint? This was a quick, easy-to-read chick-lit book. The story follows Becky as she comes back from their honeymoon to discover she has s sister and that her bestfriend has a new bestfriend. The adventure takes her up to Cumbria and even up a mountain. Many issues are casually looked at in this book – such as family, marriage, materialism and friendship. There was nothing insensitive about how Kinsella writes and it was interesting to see what materialism and shallowness can potentially do to relationships. I found Becky shallow and materialist, however I was often empathising with her. I did want good things for her and some of her experiences, in regards to friends I think we can all relate too. That and we like to treat ourselves sometimes! I wasn’t convinced by the storylines, there were a few events that I found incredibly unrealistic, however that did not spoil the story. I related to the characters, I laughed and at times could have cried. I read the majority of the book in one day. The story line took a little while to get going and I did consider putting the book down, but I can honestly say I am glad I didn’t. This is a fun, enjoyable chick-lit book.